Use only 7 Gold coins. Put the rest back in the box; they will not be used. Shuffle the Building cards and deal 35 face-down into a deck. Use only these cards during setup and play. Place the remaining Building cards back in the box without looking at them; these cards will not be used. Set up the game as usual, using the small deck of Building cards. The hand limit is still 8 cards. Important: In the solo game, you may never draw past your hand limit. There is no follow. The player always takes actions as if leading. (Note: f some actions are different in the solo game; see below). Trashing means choosing a card from your hand, and removing it from play (put it back in the box) instead of placing it onto one of the five face-up Building piles. This is part of some actions (see below). Trashing is not optional; you must trash when the rules say you must, and you may not trash at any other time. Coins and Resources remain unavailable for one turn after they are used. When you first spend a Gold coin on a Resource, it goes on the coin icon on the left as usual. At the start of your next turn, slide all Gold coins from the coin icon on the left to the Resource icon on the right - these Resources and Gold coins are unavailable this turn. On each subsequent turn, first remove Gold coins from the Resource icons on the right (these Gold coins and Resources are available again), then slide Gold coins from the coin icon on the left to the Resource icon on the right. Important: Resource cards can only have one Gold coin on them at a time, regardless of where the coin is on the card. Draw 3 cards as usual unless that would give you more than 8 cards in hand. If it would, draw only up to 8 cards. Instead of discarding one card, trash one card from your hand at the start of this action. If you cannot trash a card (i.e. you have only one card in hand) then you cannot Develop. (Remember: special powers that allow you to draw cards only take effect after the action is completed). This action is unchanged from the standard rules, but note that drawing a card after building is not optional. However, use of special powers is always optional, so you may (for example) choose not to use the Armory's Build: + | power. Pay 2 Gold coins to recruit, instead of 1. Trash 1 Building card from your hand to gain 1 gold coin. If you cannot trash a card (i.e. your hand is empty) then you cannot Tax. If a special power would normally allow you to take a card from an opponent, you may draw one card instead. If a special power would normally allow you to take a Gold coin from an opponent, you may take it from the bank instead. The game is over when the Building draw deck is empty at the end of a turn. If you take cards from the Building piles when the deck is empty, do not refill those spaces or refill the deck. 60+ Points: Imperator!! 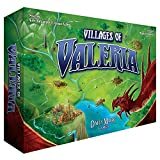 Congratulations, you've built the Capital City of Valeria! 50-59 Points: Points. Any Citizen of Valeria would be proud to call this home. Well, except for the King and the Queen. Any noble would think twice, actually. 40-49 Points: Proud Mayor. Good job, but keep trying. Maybe you'll attract a major-league gladiator team someday! 30-39 Points: One-Horse Town. Maybe some publicity would help. Can you rebrand yourself as the Bar Brawl Capital of Valeria? 29 or fewer Points: Wide spot in the road. Travelers don't even slow down when they pass through.